The Union Castle Line vessel TANTALLON CASTLE on the mud in 1959? I took this photo from the beach at Grays. She was built in 1953 at 7,448 grt. 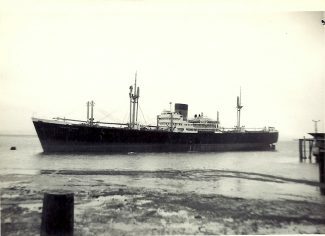 In 1971 she was sold to a Cyprus buyer and named ARISII. TANTALLON CASTLE was aground off Ward’s shipbreaking yard. That’s the old chalk jetty on the right. It ran aground very early morning and was got off on the next high water.